We park children in front of tablets, smartphone, computers and TVs. The visual and auditory stimulation captures their attention. It is a superb baby sitter. We substitute electronic displays for human attention. To distract the baby at dinner in a restaurant, we hand the baby a smartphone. To have some private time, we let the child play games on the tablet. To reduce stress before dinner, we hand the child the tablet to watch video clips or play games. The short term benefits of letting handheld devices capture the child’s attention may have long term costs. The child sits, sits and sits while being captured by the rapid changing visual scenes and auditory sounds instead of playing and enhancing motor development. The addictiveness of electronic devices occurs because we automatically attend to and are captured by rapidly changing stimuli—it is new and could be dangerous. This reaction to attend which is continuously evoked by the handheld devices may occur at the expense of developing self-directed attention. The handheld devices expose the brain and dividing cells to electromagnetic radiation which can harmful. This is the radiation by which hand held devices communicates with connect cell phone towers or the server as it connects to the web. From the precautionary principle and the numerous research studies, young children should limit the use of hand held devices. I totally agree with Cris Rowan’s superb blog, 10 Reasons Why Handheld Devices Should Be Banned for Children Under the Age of 12, which is reprinted below with her permission. 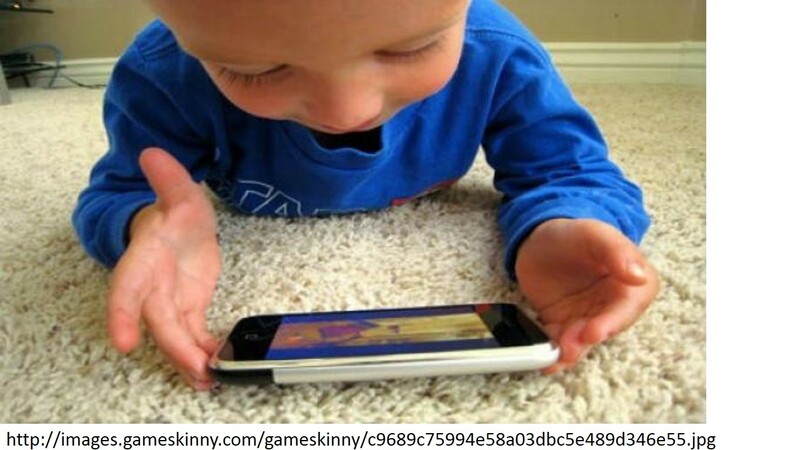 The American Academy of Pediatrics and the Canadian Society of Pediatrics state infants aged 0-2 years should not have any exposure to technology, 3-5 years be restricted to one hour per day, and 6-18 years restricted to 2 hours per day (AAP 2001/13, CPS 2010). Children and youth use 4-5 times the recommended amount of technology, with serious and often life threatening consequences (Kaiser Foundation 2010, Active Healthy Kids Canada 2012). Handheld devices (cell phones, tablets, electronic games) have dramatically increased the accessibility and usage of technology, especially by very young children (Common Sense Media, 2013). As a pediatric occupational therapist, I’m calling on parents, teachers and governments to ban the use of all handheld devices for children under the age of 12 years. Following are 10 research-based reasons for this ban. Please visit zonein.ca to view the Zone’s Fact Sheet for referenced research. Between 0 and 2 years, infant’s brains triple in size and continue in a state of rapid development to 21 years of age (Christakis 2011). Early brain development is determined by environmental stimuli or lack thereof. Stimulation to a developing brain caused by overexposure to technologies (cell phones, internet, iPads, TV), has been shown to be associated with executive functioning and attention deficit, cognitive delays, impaired learning, increased impulsivity and decreased ability to self-regulate e.g. tantrums (Small 2008, Pagini 2010). I just found a resource that is unknown to most of us on WordPress – Dr. Peper is a fascinating expert and he’s posting some very interesting health news here on WordPress. How about our good fortune today – wow. Thanks Doc!